There are countless reports, maps, and statistics that demonstrate Detroit’s population changes over the years as well as the city’s decline. What is often overlooked in these figures are the social inequalities that fueled Detroit’s continued racial inequity. Structural racism is not easy to explain in a sound bite, but it has kept the scales tipped against Detroit’s black population for the last century. The effects of structural racism can be seen in the decades of black Detroiters being relegated to lower end jobs, rarely being promoted, being the first to be laid off, and being targeted for subprime mortgages. Detroit’s revitalization is completely one-sided. The surge in investment in this majority black city is not going to black residents. I began noticing a troubling trend. First, at Whole Foods one out of the ten featured suppliers were black. Then again when the 2013 Detroit Design Festival interviewed designers and one out of eight were black. A recent United Way campaign featured eight Detroit leaders and only two were black. I could only wonder why these revitalization efforts were so lopsided. Finally, I couldn’t help but cringe at TEDxDetroit 2013 where 80% of attendees were white coming up with “solutions” for Detroit, an 83% black city. To top it off, Wayne State University’s student population doesn’t even reflect the city with almost 50% white students and 20% black with only 9% of black students graduating in 4 years. There is a very real concern over the shifting interests and populations within Detroit where the benefits of gentrification do not trickle down, but rather force more hardship on those who cannot pay to play. Increased property values don’t solve poverty or crime, they just make poverty and crime more concentrated. Last year, I began attempting to track and quantify the issue within Detroit’s revitalization as it relates to racial inequity. After working for 3 years with families across Detroit, I couldn’t help notice the absence of long-time Detroiters in development discussions, funding proposals, and the new “benefits” of a growing Detroit. The title of this post, Black Problems, White Solutions, is a reflection that in Detroit problems are seen as being caused by black people, but the solutions are being powered by white people, neither of which are true. My first challenge was that there is no demographic data (race, gender, age) published by small start-ups or even large corporations, or nonprofits. This meant that I would need to find the data myself. How could one white male possibly determine the race of hundreds of individuals involved in Detroit’s revitalization? short answer: I can’t. My next challenge was that I had to construct ideas about race in order to categorize individuals. I was extremely hesitant because I know that race is socially constructed, that individuals self-identify in very different ways, and that identity can and does change over time. It is important to note that discrimination affects minorities no matter how one self-identifies. Over a period of July – August 2014, I combed the websites of Detroit companies and start-ups for information about their staff. I, obviously, had to base my categorizations on my own assumptions and perceptions of race. I pulled headshots from individual biographies posted publicly on fellowship programs, academic profiles, and many “About” pages. All this data was then compiled into the database that I later analyzed. The article “Stereotypes drive perceptions of race” demonstrated that changes in racial categories “were driven by changes in the people’s life circumstances and common racial stereotypes.” There is also evidence that Latino individuals often choose to check the “White” box on the Census form as a sign of status. There is a similar issue where “Arab” populations are lumped into the “White” category by the Census Bureau. Our official systems to categorize race are both flawed and inadequate. Note: “American Indian” was excluded even though there were around 2,500 individuals living in Detroit from the 2010 Census, the American Indian population makes up less than 0.5% of the total Detroit population, but also bore the brunt of early slavery in Detroit. What I found, unfortunately, confirmed what I had been seeing. Detroit’s revitalization is made up of a majority of white people. That isn’t to say that Detroit’s black population isn’t contributing anything to revitalization, rather it suggests that there is a deliberate racially unequal distribution of support and funding. In total 818 individuals were identified from fellowship programs, business incubators, universities, foundations, and other “innovation” programs. Across all of the programs 69.2% of individuals were classified as White and only 23.7% as Black (1.6% Latino, 4.8% Asian, 0.7% Arab). Looking at this new data, it is clear that there is a serious imbalance of both opportunity and outcomes in Detroit. The majority of programs and institutions that were checked were grossly out of balance in terms of racial equity. 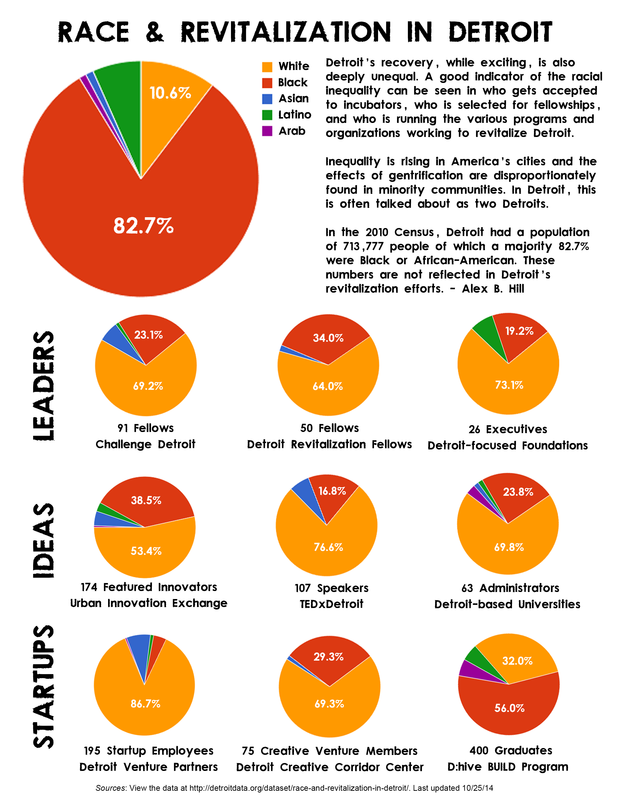 The only program that had less than 50% white individuals was the D:hive BUILD small business incubator. The Urban Innovation Exchange featured profiles also came close, but tended to feature 50% white individuals and 50% of all other races. The Wayne County Community College District notable had the most black Presidents and Vice Presidents. Those who hold the decision-making power with private funds, institutions of higher learning, and foundations support members of their own race rather than the majority race of the residents of Detroit. Note: The degree to which other minority groups besides “black” are under-represented is also a compelling result that warrants further investigation. In many ways Detroit has become the national test case for various issues: municipal pension issues, economic decline and resurgence, as well as monetizing or privatizing city services. There is potential for Detroit to become the test case for racial equity in urban centers. Detroit is at the very beginning of its efforts to revitalize and reinvest. During this period it is critical to ensure there is a structure that promotes equity in training, hiring, bidding, and selecting individuals who are the city’s present and will be it’s future. This is the critical moment where Detroit should try to lift all residents and not just those who can drop multi-millions for an expressway ramp or swoon decision-makers with a new stadium plan. Mayor Duggan has said that every neighborhood has a future, but does every neighbor have a future in Detroit? Detroit can build itself to be the city that prioritizes its people first by going beyond “community engagement.” If the city pushes for a strong community based redevelopment model from the bottom-up it could allow for a more racially equitable path forward. The city and its various supporters need to both ask Detroiters what they want to see in their communities and give them the tools, training, and support to make it happen. There is no reason that community development can’t also lead to citywide revitalization. Thanks to the many people who gave me comments and feedback throughout the process of putting this together.